OPICO is introducing two new trailed drills into the UK market following its appointment as UK distributor for French machinery company Sky-Agriculture. The EasyDrill and MaxiDrill will be launched at LAMMA 2016. OPICO’s MD James Woolway explains: “Sky-Agriculture is a relatively new company: it is a partnership between David Guy, a farmer and agronomist, and Julian Burel of Sulky. It was established in 2013, and is based on a farm – ‘La Conillais’ – just north of Nantes in north-west France. Here, both machinery and cropping trials take place, and new techniques have been evolved over a number of years. So Sky’s products draw on Sulky’s decades of experience in seeding techniques and agricultural machinery manufacturing, together with practical on-farm trials. “Sky is a new brand which has made a huge impact on the European market in a very short time. The new thinking and superb engineering behind the machinery allows farmers more flexibility, and to employ a more weatherproof strategy than other machinery on the market at present. On display will be Sky Agriculture’s trailed direct drill – the EasyDrill which is easy to set up and use and versatile. It is suitable for No till, Minimum till, or Conventional drilling systems, and it is also an ideal choice for drilling into cover crops. 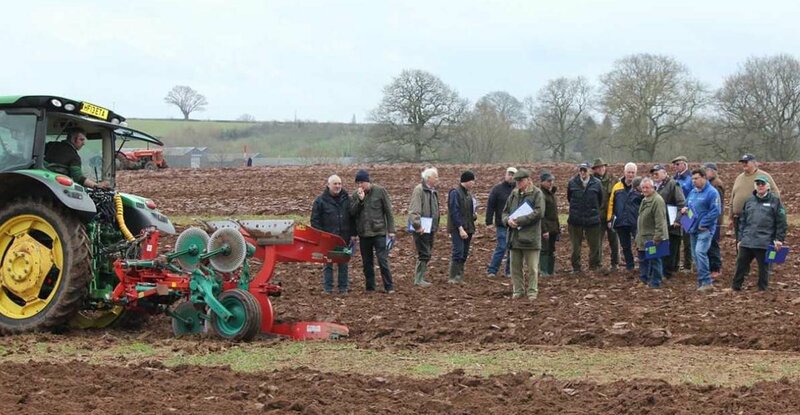 “Although the EasyDrill is classified as a ‘direct drill’, its design offers farmers a lot more: it is capable of working on consolidated ploughing, in min-till conditions, as a direct drill, or as a cover crop drill, and is equally at home in each environment. “This versatility means farmers have the flexibility to adjust their drilling plans when the weather intervenes, or when they are forced to make rotational changes due to resistant Blackgrass issues. In direct drilling conditions the 3.5 degree disc angle ensures minimum soil disturbance reducing the germination of volunteers and weed seeds. Furthermore, the carbide-tipped skim coulter keeps both the disc and the seed slot clean ensuring consistent seed placement. As the coulter is suspended between a rubber front roller and two rear metal gauge wheels the accuracy of seed depth is similar to that of a precision drill even when working on uneven soil. On even the hardest of untilled soils, the EasyDrill can still be used as a direct drill, as it is designed to be able to apply up to 250kg of pressure through every disc. Also being shown is Sky-Agriculture’s trailed MaxiDrill – a mintill drill which can also be used in conventional systems. Moreover its design allows drilling to continue even when conditions turn sticky. The MaxiDrill’s hydraulically adjustable cultivator discs are individually rubber-mounted to protect them from stone damage and allow them to follow the ground. Their high rotational speed and small scallops ensure that all the soil is moved and a fine tilth is created in front of the press roller. The offset press roller wheels evenly consolidate the soil surface behind the discs. Importantly, the press roller is dedicated to work in the field and so suitable tyres and tyre pressures are used for pressing the soil, unlike drills that use the press roller for transport too. The two rows of Culti-Disc coulters are mounted on springs to allow them to follow the contours and protect them from stones. The clearance between the rows of 56cm allows the MaxiDrill to cope with high stubble residues and sticky wet conditions where other more compact machines will struggle. Furthermore, the press wheel which also controls the depth of the Culti-Disc coulter closes the seed slot and consolidates in all conditions. The frame design that all the elements of the Maxi-Drill are mounted on, allows more clearance for soil and trash to move through the drill, which is a fundamental feature as it means it is capable of working in adverse conditions.